NWLSSP schools compete in the Leicester-Shire & Rutland School Games, part of the national ‘School Games Programme’ which is a unique opportunity to motivate and inspire young people to take part in more competitive school sport. It is open to all young people aged 6-18 years, of all abilities and backgrounds from every school across Leicestershire, Leicester and Rutland. 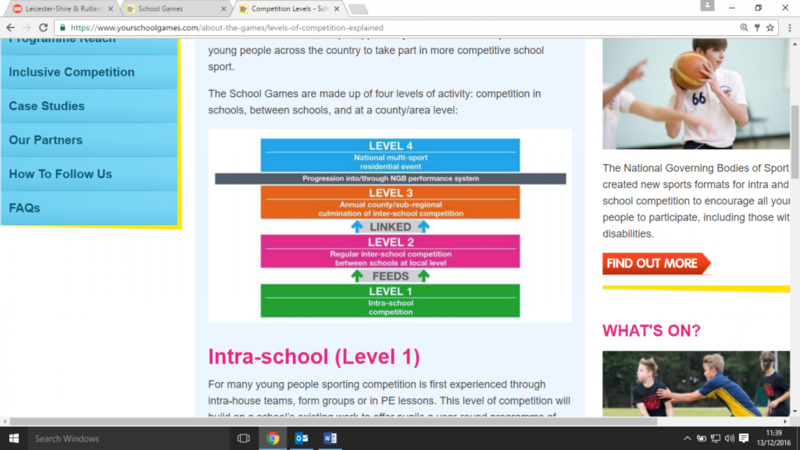 Click on the logo below to go to the School Games website. Delivered locally by the NWLSSP in conjunction with Leicestershire and Rutland Sport, local sports clubs and other School Sport & Physical Activity Networks (SSPANs), the School Games provides schools with the chance to boost their existing work in school sport to create a year-round calendar of competition for all students. Each Year NWLSSP runs over 100 competitions and festivals that provides schools the opportunity to compete in a wide range of sports many of which feed through to level 3 county competitions. In 2017/18 NWLSSP schools finished 4th out of 10 districts in the medals table at county competitions. Schools won 7 gold, 5 silver and 4 bronze and won Spirit of the Games 4 times, placing them joint 3rd ranked district.